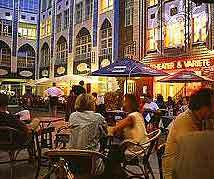 Berlin is full of wonderful and exciting places to eat out, with a wide choice of every kind of food imaginable. The many stylish locations and enormous variety of excellent, mouth-watering menus provide nothing short of culinary perfection. Whether you are looking for a romantic meal for two or trendy, lively dining, the only problem is deciding where to go as there are literally thousands of restaurants and cafés to choose from! Restaurants can range from nouvelle, food served in glamorous, sophisticated and expensive restaurants, to hearty local dishes served in atmospheric and inexpensive inns. Berlin has all of the possibilities that you would expect from a large, cosmopolitan, capital city. The more established restaurants can be found in the west side of Berlin, but many eastern districts have recently started to open good restaurants and eateries. In general, the eastern establishments are often fairly trendy and cater for younger people, with nouvelle and ethnic menus. There is plenty of choice throughout the east and west, and an abundance of excellent food. Dining in Berlin does not need to be expensive, with reasonably priced meals, and drinks are usually similar to bar-prices. By law, restaurants are required to display their menus and prices by the door, together with their opening hours. 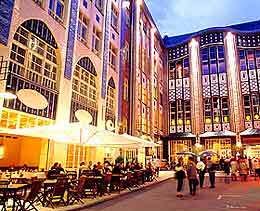 For some of the cheapest meals, venture out of the main city centre, where most neighbourhoods have their own collection of eateries, with traditional German restaurants, cafés and inns serving up great food, with a friendly local atmosphere. With many immigrants now resident in this cosmopolitan city, cuisine in Berlin has become much more varied, with Italian, Indian, Greek, Thai, Mediterranean and in particular, Turkish cuisine. Traditional German food often consists of solid, fatty food served with a healthy salad or similar. Pork is a staple part of the German diet and is prepared in many different ways, such as sausages, smoked and pickled pork chops, hamburgers and even pig trotters. Speciality dishes in Berlin include knuckle of pork with pickled cabbage (Eisbein mit Sauerkraut), rolled stuffed beef (Rouladen), suckling pig (Spanferkel), fried potato cakes (Kartoffelpuffer) and frankfurters, which are served throughout the city. Desserts can be disappointing and more emphasis is paid to the main meals and starters. One of the more distinctive German desserts is a mix of hot or cold berries, served with vanilla sauce. Other choices may be ice cream, stewed fruits and a selection of cheeses. Most cafés however do serve splendid gateauxs and many other delicious cakes. 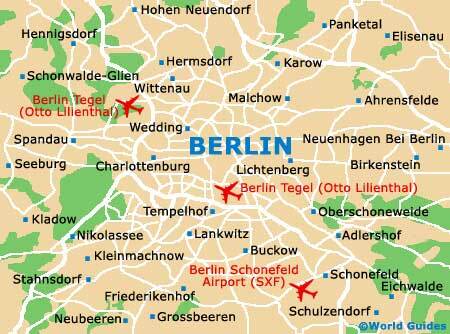 The majority of Berlin restaurants open daily for lunch and then again later for dinner, at around 17:00 to 18:00. Berliners are renowned for going out late and staying out late, and so many restaurants keep their doors open way past dinner time. At the weekends, restaurants are often open until 02:00 or even 04:00, although food is normally not serviced after midnight.